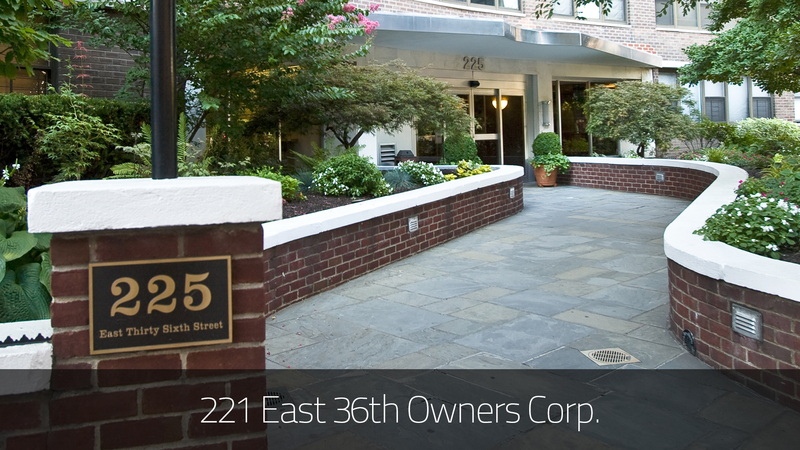 221 East 36th Owners Corp. The Murray Hill Crescent was built in 1963 and is a larger cooperative, consisting of 286 units over 21 stories. If seller is an estate, the following must be submitted: (i) Certified copy of the Death Certificate. (ii) New York State Tax Waiver for transfer of shares and proprietary lease; applies to individuals who died before February 1, 2000. (iii) Recently issued (60 days) Letters of Testamentary naming executor(s) or Letters of Administration naming administrator(s). (iv) Federal Certificate Discharging Property Subject to Estate Tax Lien. If not applicable provide evidence that none is required. (v) New York State Release of Estate Tax Lien. (vi) Certified Copy of the Will and Testament or Grantor Trust. (vii) Affidavit of Debts and /or Domicile (enclosed). (viii) Affidavit or Letter from the Executor or Administrator of the Estate stating that the Federal and New York State Taxes either have been paid or sufficient funds are available to pay them and they will in fact be paid (enclosed). (ix) NOTE: All executors or administrators are required to sign the stock power and assignment of proprietary lease. (x) PLEASE BE ADVISED: Originals of all documents (except the will) will be required at closing. Provide a statement from the applicant(s) explaining in detail the source of funds for the purchase of the apartment. If selling a residence, provide a copy of the pending contract of sale or listing agreement or copy of the closing statement. NOTE: Guarantors must also submit a Purchase Application. NOTE: Guarantors must also submit a Financial Statement. (1) No personal computer generated statements are accepted. (2) All amounts listed on the financial statement must have supporting documentation, including the most recent three (3) months bank statements (all pages) and copies of brokerage statements, etc. (3) You may be required to submit updated bank and brokerage statements after Board Review. (4) The amounts set forth on the Financial Statement form must be equal to the amounts on the supporting documentation. (5) Financial Statement amounts and all supporting documentation must be in USD. If funds are held in overseas accounts, a certified bank letter verifying the USD value must accompany said documentation. (6) NOTE: Guarantors must also submit supporting documentation. Provide copies of the last two years Federal Income Tax Returns, State and City Tax Returns, signed and complete with W-2 and/or 1099 forms. Provide copies of the past two (2) months pay stubs for each applicant. NOTE: Guarantors must also submit Pay Stubs. For each bank listed on the financial statement, provide a letter showing current status, how long account has been opened, and the current balance. (1) Reference letter must be on company letterhead and include salary, length of employment, position, bonuses and prospect for continued employment. (2) If self-employed, provide a C.P.A. letter stating length of time the company has been in existence, nature of your business, expected net income for the current year, and position held. (3) If retired, provide copies of pension and/or social security award letters. (4) NOTE: Guarantors must also submit a reference/verification letter. Letters should be on company letterhead. Provide two (2) reference letters per applicant. Letters referencing both applicants is also sufficient. Provide one (1) reference letters per applicant. Letters referencing both applicants is also sufficient. NOTE: Form is applicable to residential dwellings built prior to 1978. PLEASE BE ADVISED: Applicant(s) must download the Lead Brochure directly from the building page. Provide written consent from your lender to sublet. Please be advised this may take some time to obtain, so please do so as soon as possible. If you do not have financing on your apartment you must provide the Board with a notarized letter signed by each tenant-shareholder stating that fact. NOTE: Completed by Shareholder. Upon submission of application, shareholder must submit to management, a sublet security deposit of $1,000 payable to 221 East 36th Owners Corp. Complete and sign both Corporation’s Right to Cancel Sublease and Assignments of Rents. NOTE: Guarantors must also submit a Sublease Application. Provide copies of the last two (2) year’s Federal 1040 Tax returns, signed and complete with W-2 forms. If self-employed, copies of the last two (2) year’s Financial Statement and Business Tax returns. (1) Reference letter must be on company letterhead and include salary, length of employment, position, bonuses and prospect for continued employment. (2) If self-employed, provide a C.P.A. letter stating length of time the company has been in existence, nature of your business, expected net income for the current year, and position held. (3) If retired, provide copies of pension and/or social security award letters. (4) NOTE: Guarantors must also submit reference/verification letter. Complete and provide forms to Doorman upon approval. Shareholder must be a resident for a minimum of three (3) years before applying to sublet. Shareholder must be in good standing and paid up to date with maintenance and other fees. Permission to sublet must be requested in writing 60 days prior to submitting sublet application. One (1) year lease term no automatic renewals permitted. Maximum number of years a shareholder can sublet during ownership is three (3) years. Maximum number of sublets will be 28 or 10% of the units. Open House Policy - Only two permitted per day. Shareholder must schedule with Super and Property Manager Assistant.